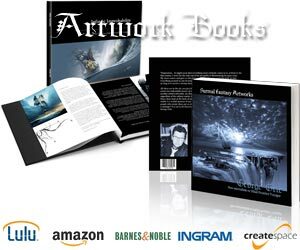 His artwork images regularly include elements with a brilliant quality. Favorite subjects are astronomy and visions of utopian worlds. His most well-known works center on 3 main topics: Celestial Exploring, Galactic Railroadm and Starry Tales. Gallery of Picture Publisher, KPT, Simply 3D, and Bryce generated images.